At TOPCU we provide members with a variety of loan programs and offers. Members using Online Banking can apply for a loan conveniently and securely from your online account. Simply login to Online Banking and click on the Services tab to start your loan application. View our current Loan Rates. If you prefer to discuss your borrowing needs with a member services representative, give us a call at (520) 881-6262 ext. 702 or toll-free at (800) 440-8328, or visit us at any of our three branch locations. TOPCU Members: Begin the loan process by logging on to your Online Banking account. 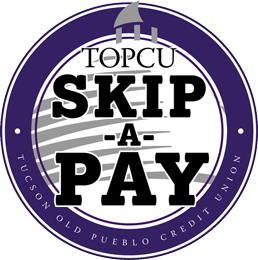 Take advantage of TOPCU’s Skip-A-Pay Program and put a little extra cash in your pocket when you need it. Click below to find out which loans are eligible and how the Skip-A-Pay program works. Make sure you’re building your credit history and enhancing your borrowing power. You can request a free credit file disclosure, commonly called a credit report, once every 12 months from each of the nationwide consumer credit reporting companies: Equifax, Experian and TransUnion. AnnualCreditReport.com is the official site to help consumers obtain their free credit report.